Sanctioned by Badminton World Federation and hosted by Hong Kong Badminton Association, the 6-day “Yonex-Sunrise Hong Kong Open Badminton Championships 2018 - Part of the HSBC BWF World Tour Super 500” will be held during 13-18 November at Hong Kong Coliseum. The event this year is the 14th consecutive year sponsored by Yonex-Sunrise with total grand prize money of US$400,000 and one of the HSBC BWF World Tour Super 500. 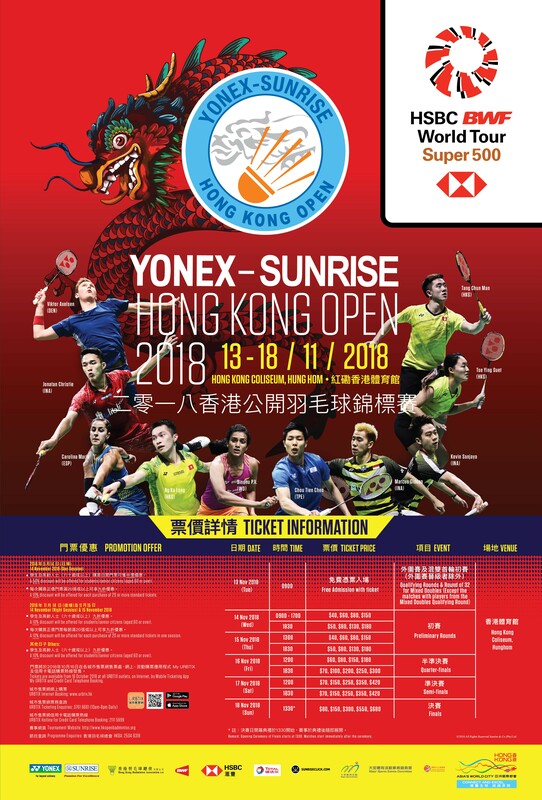 “YONEX-SUNRISE Hong Kong Open 2018 - Part of the HSBC BWF World Tour Super 500” is proud of being an “M” Mark event that helps enhance the image of Hong Kong as Asia’s sports event capital. The “M” Mark awarded by the Major Sports Events Committee, symbolising intense, spectacular and signature event in the territory sports calendar. Mr. Tong Wai Lun BBS MH JP, HKBA Chairman, expressed that the competition entry is overwhelming and attracted 320 players from 20 countries / regions enroll for the tournament this year, out of which 266 players from 18 countries / regions are qualified to enter, including 36 from China, 30 from Indonesia, 29 from Chinese Taipei, 29 from Japan, 23 from Thailand, 21 from Malaysia, 20 from Korea, demonstrating a full strength of players. Participating stars include all world number one of five events, namely: Men’s Singles – Kento Momota from Japan; Women’s Singles – Tai Tzu Ying from Chinese Taipei; Men’s Doubles – Kevin Sukamuljo/Marcus Gideon from Indonesia; Women’s Doubles – Yuki Fukushima/Sayaka Hirota from Japan; Mixed Doubles – Zheng Siwei/Huang Yaqiong from China. There are also medalists from World Championships: Men’s Singles – Shi Yuqi, Chen Long; Women’s Singles – Akane Yamaguchi, Sindhu P.V., Carolina Marin; He Bingjiao; Men’s Doubles: Li Junhui/Liu Yuchen, Zhang Nan/Liu Cheng, Keigo Sonoda/Takeshi Kamura; Women’s Doubles – Mayu Matsumoto/Wakana Nagahara; Mixed Doubles: Wang Yilyu/Huang Dongping, Zhang Nan/Li Yinhui, Tang Chun Man/Tse Ying Suet. Also Asian Games medalists: Men’s Singles - Jonatan Christie, Chou Tien Chen; Women’s Singles – Saina Nehwal; Men’s Doubles – Fajar Alfian/Muhammad Rian Ardianto; Women’s Doubles: Misaki Matsutomo/Ayaka Takahashi, Chen Qingchen/Jia Yifan. Other top players include: Lin Dan, Viktor Axelsen, Son Wan Ho, Nozomi Okuhara, Sung Ji Hyun etc. The Hong Kong Badminton Team will continue to send all their elite players to attend this year, including Men’s Singles: Ng Ka Long, Wong Wing Ki, Hu Yun, Lee Cheuk Yiu. Also Cheung Ngan Yi, Yip Pui Yin; the mixed doubles duo of Tang Chun Man/Tse Ying Suet and Lee Chun Hei/Chau Hoi Wah; youngsters Ng Tsz Yau, Yeung Nga Ting etc., a total of 22 players from the Hong Kong Team. A tournament with such fierce competition among so many elite players will surely bring lots of excitement. 13 November is free for distribution. Interested parties can send self-address envelope with stamp $2 to HKBA office. Four tickets are distributed for each person while tickets are available. Enquiry: 2504 8318 (on or before 6 November 2018); 2330 3318 (7-18 November 2018).